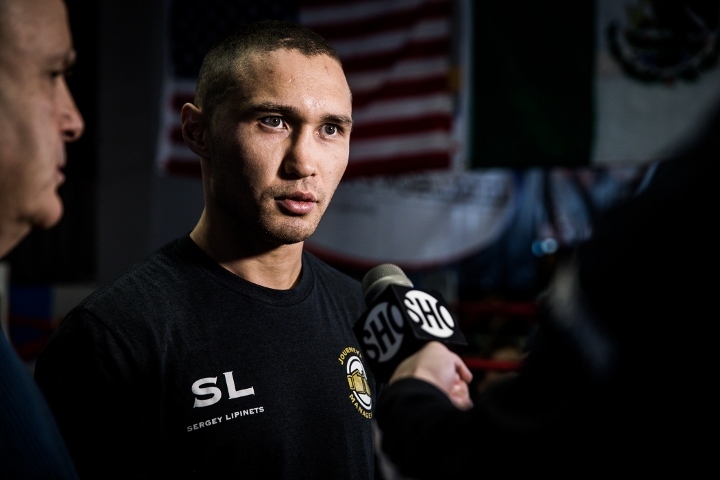 Even coming out of a 2018 in-ring campaign he’d like to leave in the rearview mirror, Sergey Lipinets continued to struggle to line up willing opponents. The frustration was to where he was willing to go nearly eight months between fights in addition to traveling to his opponent’s hometown just to have a guaranteed fight date. So goes his journey to the greater D.C. area, where he faces former two-division titlist Lamont Peterson this Sunday in Oxon Hill, Md. The bout—which headlines a Sunday evening edition of Premier Boxing Champions (PBC) on FS1—marks the first piece of ring action for Lipinets (14-1, 10KOs) since a 10-round decision win over Erick Bone last August in Long Island, New York. It marked his first fight beyond super lightweight, where he previously held a title until suffering his lone career defeat in a hard-fought decision versus then-unbeaten Mikey Garcia last March. Lipinets—a former kickboxing champion in Russia—enjoyed an accelerated path towards the title. He was matched aggressively from early in his career, fighting a title eliminator in his just his 11th pro fight and winning a belt just two fights later. Now a year removed from his title reign, the hard-hitting Russian boxer—who turns 30 on the eve of fight night—was eager to maintain a championship level of competition. That led to his agreeing to a clash with Peterson, a D.C.-based former two-division titlist who hasn’t fought since a knockout loss to Errol Spence last January. “I feel that Lamont is very solid test for me and his style will bring the best out of me,” Lipinets told BoxingScene.com. “Me and my team have studied his fighting style and have come up with couple of tricks of our own. aaaah Peterson is in the ring eh? this should be interesting to watch he's normally entertaining for me to watch in the past..